Throttle Reverse, Propeller Feather and Cut-Off mixture on single and twin engine airplanes. Those are indispensable features on a throttle quadrant. Adjustable travelling touch on levers. Have you ever had a poor touch feeling when using the levers on a throttle quadrant simulator? Those days are gone, now you can set the required strength to match your desired peformance. Have you ever had a poor touch feeling when using the levers on a thorttle quadrant simulator? Those days are gone, now you can set the required strength for matching your desired peformance. These three functions are indispensable features on a throttle quadrant. Virtual-Fly delivers its Throttle Quadrant simulators with compatibility on FSX, P3D and X-Plane software. 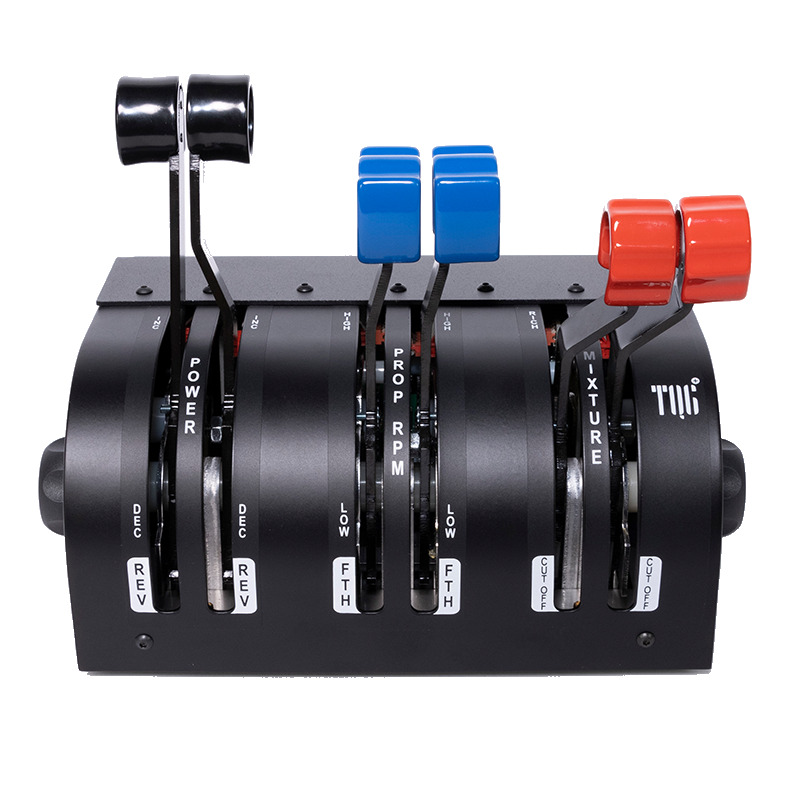 We wanted to make the best Throttle Quadrant in the market, so now we've added a PLUS. Hall effect magnetic sensors make this a Life-Long product. Your hands even more for real. High resolution, 12 bits of precision on all axes, doesn't need calibration, comes calibrated from factory. Adjustable strength on the levers travelling for a more accurate and real touch. Reverse, feather and cut-off functions with detention zone. Compatible with P3D, FSX and X-PLANE. Incredibly real! Designed to simulate the minimum effort exerted in real aircraft. Unique amongst its kind. Adjust the pressure to the one you wish to exert on the controls. Prepared for piston engines, turbo-propellers and turbo-fan (reactors). Each control is set at a different height and has a different colour, just like on real aircraft. For set-up please go to the DOWNLOADS section and reach for the TQ6 manual, you have everything explained there! Hall Effect Magnetic Sensors. A Life-Long product.